I’ve been a Doctor Who fan since 1985, back when budgets were low and one had to stay up until 1am (or later) on Saturday night to get a weekly Doctor Who fix. The character of the Doctor appealed to me, generally using his wits rather than weapons to defeat his foes. What or who is Doctor Who? It’s a British science fiction TV serial that first aired on November 23, 1963. The ‘Who’ in the title refers to the mystery surrounding the main character, known only as The Doctor, his real name never being revealed. The Doctor is a Time Lord from the planet Gallifrey. His people mastered the mystery of time travel but chose to observe rather than interfere in the lives of other people and planets. The Doctor, however, as he put it in the 1969 story The War Games, ‘got bored’. So he left his planet in a stolen time machine called a TARDIS (Time And Relative Dimension In Space), became a self-imposed exile, and travelled time and space fighting injustice in the Universe. The Doctor has the ability to regenerate, to die and be reborn, and with each regeneration his appearance changes. This allows different actors to play the role. So, every three years or so, one actor leaves the show and another takes over, which accounts for the program’s longevity. Thus far 11 actors have starred as The Doctor in the British Broadcasting Corporation’s long-running show, and a 12th recently made his first appearance in the 2013 Christmas episode. The ‘classic’ show ran continuously from 1963 to 1989, a Saturday tea time staple until the early 1980s when the BBC began experimenting with time slots. Seven actors played the role during this period. 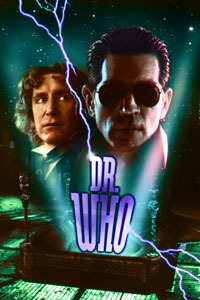 Later, a US/UK coproduced Doctor Who, featuring an eighth actor in the role, was attempted in 1996. It was a big hit in the UK but not in the USA and so remained a standalone film rather than a series. In 2005, the program was revived by the BBC, with Russell T. Davies acting as executive producer and head writer. Davies created the TV series Queer as Folk for Britain’s Channel 4 network, which was later reworked for the American cable network Showtime. Steven Moffat, who co-created the hit series Sherlock, a contemporary reimagining of the Sherlock Holmes story, is the current executive producer/head writer for Doctor Who. The revived Doctor Who has currently run for 7 seasons and is one of the top rated dramas on British television, as well as the highest rated show on the US cable channel BBC America. Amazingly, November 23, 2013 was the 50th anniversary of the first broadcast of Doctor Who! So whether you’re new to Doctor Who or a seasoned veteran, a veritable gold mine of treasures awaits you. And stay tuned for the next installment of Adventures in Time and Space, which focuses on books about The Doctor. This entry was posted in Audiobooks, Fiction, Graphic Novels, Movies & Television, Science Fiction & Fantasy and tagged Dr. Who by dawhite2014. Bookmark the permalink.